Wrestling announcers inconsistently called him Haystacks or Haystack Calhoun. But always "...from Morgan's Corner, Arkansas." He always greeted the interviewer with a big "Hiya, Neighbor!" His finisher was "The Big Splash," where he'd jump up and land on his poor prone opponent belly first. "That's all she wrote!" ringside announcer Ray Morgan would scream. 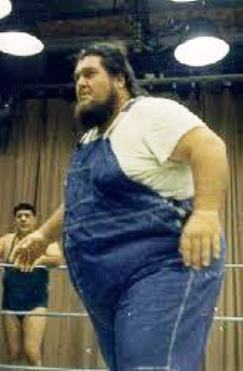 He played the role of a country bumpkin who'd learned his rasslin' "on the farm back home rasslin' pigs." In fact, of course, he'd been shown the ropes in a professional wrestling school first and assigned his character by promoters. I think that's Angelo Savoldi in the background but I could be wrong.